Radiant cooling panels, although relatively rare in North America, have been used successfully in European applications for at least 15 years. Radiant cooling follows the same principles as radiant heating, but in reverse. Thermal energy is exchanged between the heat loads present in the space, and the cool ceiling. To ensure air quality and removal of the moisture load in the room, radiant cooling panels need to be used in conjunction with a small ventilation system. However, since radiant cooling systems do not use forced air flow to facilitate cooling, a uniform cooling gradient in the room is created. With this reduction in draft, radiant cooling panels provide a very comfortable environment for the occupants of the cooled space. Operational costs are reduced for the mechanical chilling system since cooled ceilings operate at relatively high temperatures (average surface temperature of 16°C or 61°F). Chillers can operate at higher temperatures resulting in an increase in efficiency and reduction in energy costs. Radiant panels can be used as both heating and cooling panels reducing the amount of equipment and piping required compared to conventional heating and cooling system. Cooled ceilings are silent and virtually draft free since air flow volumes are reduced compared to conventional systems (typical radiantly cooled office building: 2 to 3 air exchanges per hour compared to 6 to 10 with conventional systems). Radiant cooling panels can be retrofitted into the false ceilings of older buildings as the plenum space requirement is minimal relative to fan coil units or VAV systems. Smaller plenums result in savings in building height (1' per floor!) compared to air conditioning systems. A radiant cooling system is a more efficient means of cooling an environment than a forced flow system. This is due to the fact that it is much easier a task to pump water, than it is to blow air. The actual amount of energy saved is dependent on many factors, including how well the building is insulated, the building size, and whether or not the system takes advantage of free cooling. There have been a few studies on the energy savings created by radiant panels. International Energy Studies have performed tests of Hydronic Radiant Cooling in a High-rise Office Building in Oakland, California, which demonstrates some of the cost savings associated with this technology. The Lawrence Berkeley National Laboratory also have performed studies of the energy savings of Hydronic Radiant Cooling Systems. There is very little involved with the maintenance of a chilled ceiling. Once correctly installed, the radiant panels themselves would require little or no further maintenance. This is due to the fact that they have no moving parts, and that they are up and out of the way. The other equipment such as water pumps, control valves, dew point sensors, and chillers, would require some maintenance, but these would be standard operations. Less maintenance would be required for the air handling and air conditioning units due to the reduction in size and load required by the building. This means that the plenum height could be reduced by approximately one foot per floor! A reduction in plenum height can be translated into a reduction in overall building height. If this technique were to be applied in the construction of a ten-story office tower, the total height of the building could be reduced by ten feet'. This would translate into significant savings in material and labor in the construction of the building's structure. 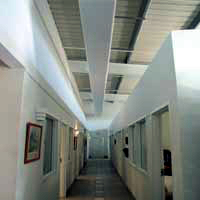 Radiant cooling panels are mainly used in public buildings. These include: hospitals, office buildings, libraries, museums, schools, nursing homes and many more. Radiant cooling panels can be installed anywhere radiant heating panels are used. Radiant cooling follows the same principles as radiant heating. The heat transfer occurs between the space and the panels through a temperature differential. However, unlike radiant heating, the colder ceiling absorbs the thermal energy radiating from people and their surroundings. The major difference between cooled ceilings and air cooling is the heat transport mechanism. Air cooling uses convection only, whereas cooled ceilings use a combination of radiation and convection. This amount of radiative heat transfer can be as high as fifty five per cent, while convection accounts for the remainder. With cold ceilings, the radiative heat transfer occurs through a net emission of electromagnetic waves from the warm occupants and their surroundings to the cool ceiling. On the other hand, convection first cools the room air due to contact with the cold ceiling, creating convection currents within the space which transfers the heat from its source to the ceiling where it is absorbed. Condensation on the surface of the panels is not a problem with radiant cooling. Since condensation of water occurs when the dew point temperature is reached, proper water temperature control will help avoid any condensation. To prevent the formation of condensation, a sensor monitoring the dew point temperature of the room is used in conjunction with a controller which modulates the inlet water temperature accordingly. Therefore, if a risk of condensation is present, the water temperature is raised or the water flow is shut off. However, since the lower the panel's inlet temperature is, the more work the panels do, the inlet temperature should be determined to be as close as possible to the room's dew point temperature. Consequently, the cooling capacity of a radiant cooling system is generally limited by the minimum allowable temperature of the inlet water relative to the dew point temperature of the room air. Is Radiant Cooling Appropriate for Residential Applications? Unfortunately radiant cooling is not a good choice for residential houses. Radiant panels require the air in the space to be dehumidified and controlled very carefully. In a residential home, the ability to open windows or leave doors ajar, would allow humid outside air to enter the space. This could raise the dew point temperature to a point where to avoid condensation, the radiant panels would have to operate at relatively high temperatures. Since the panel's cooling capacity is dependent on the temperature differential between the panels and the room temperature, having to raise the panel temperature to avoid condensation would severely hamper the panel's cooling ability.